"If I had my own way, this blog would probably be all backwards". When I loaded blogspot today, I was thinking that that would be the opening line of today's entry. Then I realised that I do have my own way and that, if I wanted, I could write this whole thing backwards. Nobody might be able to understand what I was going on about, but I cannot exactly be ejected from the Internet for lack of cohesion. I cannot be ejected from the Internet! - unless Mum pulls the plug on me, but then her internet would go down and she wouldn't be able to write her own blog so that would be like cutting her head off to spite her face (never mind her nose). Also, she's out fishing with my oldest little brother right now, so...nahahahahahaha?! Back to the land of sanity, well, sort of: what I'm trying to get at is that there would appear to be no real logical order to the way in which I discuss things here, and it would take me some impossibly long entries to be able to cover each topic in any real amount of detail. The only way around this that I can see is to post what I want when I want, and make sure that I have tagged it properly so all of the posts on, say, sexuality in Second Life can be found together under the tag "sexuality" which should be available for clicking on the right-hand side. You probably already knew that anyway. In light of my lacking eloquence today, I've decided that I am going to jump into the deep end and make a post that possibly shouldn't be written yet. Second Life requires that the mind be transferred to a digital body – which is an idea I will come back to – and this digital body is completely without organs. The bodily needs and functions one must attend to in the Real World are simply not shared by the pixel-representation on the screen. That makes sense, right? If there is something "wrong" with the human race as a whole, it is our squishiness, and our dependence upon produce, items, whatever, beyond ourselves to survive. 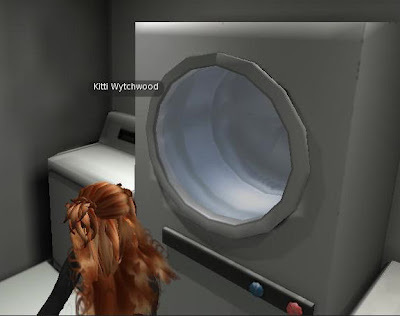 When recreating the world, if it can be said that Second Life is such (which I think it can, but that's a whole other blog post), these are the first things we'd get rid of, and nobody could blame us for that. All of the things you see in Second Life have been created by the residents themselves......It [Second Life] is marketed as a place to ‘be different, be yourself, free yourself'. If there is something we loved about our first life, we could repeat it ad nauseam. Also, because of the user-created set-up of Second Life, only the spaces and objects people want to build are materialised within the virtual. Got all that? Linden Lab host only the servers, and the basic items for the Second Life user which includes the original base avatar, a handful of skins and clothing items, and obviously the software that allows you to "view" the SL realm. Everything within SL is conceived, built and used by the SL users. And there is no limit to what you can build but your own imagination. It is possible to purchase templates for things, and, if a user allows, to edit them and custom items/clothing to your own needs, but each SL user also has access to sandboxes and the software to built and script items of your own creation. It's not quite as easy as it sounds, but there are plenty of tutorials available online, and there is even a museum is one of the main sandboxes that gives you a kind of step-by-step guide on how to begin building. To me, it seems like a cross between Paint and that horrible 3D design software they tried to make me use to build a mobile phone in Graphics in year nine. So, with all that in mind, answer me this question: why did someone build these? Do dirt and ketchup stains exist in SL? Persil haven't researched this market! I took this to go into my essay. Looked a bit weird, me walking in and screenshot-ing the toilet. What was more weird? The dark smudge on the left-hand side is the arm of some guy who followed me in. The weirdest thing - or, perhaps the most sane - is that neither of these items function. The washing machine didn't open, and you cannot sit on the toilet or flush it. Someone did go to the extent to build the toilet-roll holder, too, which I imagine came with the toilet itself. I should perhaps further explain that I found both of these on spaceships which are used for sci-fi role-playing. I have been involved in a couple of these sci-fi rps on these spaceships, and I have never seen anyone say "Ah, I just need to pop for a wee" or "Ooo, I got blood on my jumpsuit, better put it on a spin cycle...". Surely these rps are meant to inject excitement, give you a chance to exist beyond the mundane, do things you couldn't otherwise do...but apparently, doing your laundry is exciting enough for someone to want to make such an experience possible online. Does Second Life offer too much freedom for us to comprehend or be comfortable within? Do we just cling to what we know? There is another theory. 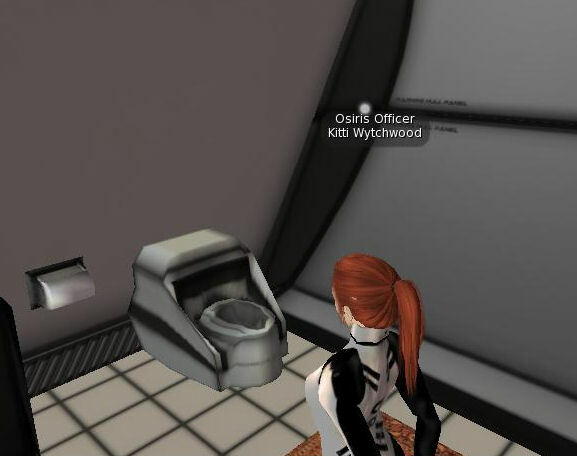 I was told by the owner of both of these spaceships (who I shall no doubt mention later, he has been a fantastic help to me in SL) that the toilets aren't used for...well...disposing of waste. There is no delicate way to phrase this, so I shall just refer you to this page here and offer this page here as a back-up, and hope that you can either put two and two together for yourselves, or remain blessfully unaware. Hmmmm...I am so glad that I got fed up with SL after the first half hr or playing. I went here and here and I believe I get it!